The Holistic Medicine Detective Finds Solutions To Your Health Problems...That Work And Won't Harm You! You Really Must Become Your Own Holistic Medicine Detective And Learn How To Maintain or Improve Your Health And Become An Educated Consumer of Health Care Services! If you want to not only survive now but also thrive in the future, you really have to have the knowledge of a good Holistic Medicine Detective. You need to know what is honestly good for you and what honestly is not. 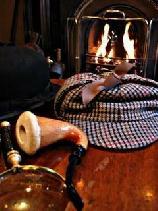 To do that you need the skills and perseverance of a great detective. Or you can just use this website to become better informed. Keep yourself safe from Medical Predators. In a recent book "Death By Medicine" authors Gary Null, PhD, Martin Feldman, MD, Debora Rasio, MD and Carolyn Dean, MD, ND say, "The number of people who die each day because of medical errors - physician mistakes, hospital-related-illness, and reactions to FDA approved medications - is the equivalent of six jumbo jets falling out of the sky. More Americans are dying each year at the hands of medicine than all American casualties in World War I and the Civil War combined." And in their final overleaf quote, "It's death by medicine." They are referring to MD type medicine not Traditional Chinese Medicine, not Oriental Medicine, not Holistic Medicine and not Natural Medicine and not Herbal Medicine. There are much safer and yet still effective alternative treatments for most drug prescriptions and surgical procedures. How can you choose them, if you don't know about them? You have to be like a detective and search them out...you can find out about many of them right here. You can learn about the things you can do yourself to improve your own health...and live a longer, healthier, happier life and save thousands of dollars and needless and often painful recovery time after surgical procedures. Do you remember the old saying? An ounce of prevention is worth a pound of cure. It's as true now as it ever was. Don't "do yourself or your family in" by using dangerous chemical products. Learn about sources of safe, natural, "green" products for your home or office. Eliminate chemical toxins from your home and keep safe. And finally ending up where we began our argument...Make better informed Health Care Decisions for yourself and your loved ones. Keep yourself and those you love safe. Here's a secret...it is not that hard to become better informed. You don't really have to become a Holistic Medicine Detective yourself, I've already done a lot of the detective work for you. And I'm here to help make it a whole lot easier for you. Click here to find out the single most important reason that you need to become your own Holistic Medicine Detective. If this doesn't convince you that you need to educate yourself about what good and safe health care is and why it is so important to you then I don't know what will. This is really a carefully laid out...step...by...step (or clue by clue) way for you to move through this website in a way where you will be learning about healthcare in an elegant and efficient way. Learn To Become Your Own Holistic Medicine Detective... Apprentices Wanted... Free Training Provided Here!The Formal Training of A Holistic Medicine Detective. How I Did It.Establishing My Credentials As A Good Teacher For You! ...I first became a Medical Disability Examiner in the 1970s and received incredibly valuable training in Modern Medicine what some call "Allopathic Medicine." Here is what happened...these things really happened to me. Imagine during your four years of education, preparation and training...they told you what actions to take now to heal each problem! Even you might have been as skeptical as I was...after all is everything you read or are told true? You know based on your experience in life...that everything we are told may not be true...not always. Now, imagine that your teachers took you into the clinic and guided and advised you as you treated patients in need of healing with what you had read and been told would work. And it worked way better than you could have imagined...and you were 47 years old and had a lot of experience in life! Imagine that these were not easy cases who came for help. These were actually the worse off people for whom all else had failed including Pharmaceutical Drugs and even Surgery. ...these were the people who came for treatment, not out of a whim or a wish or a fantasy...but because they were desperate for help. I didn't know it then but I was becoming a Holistic Medicine Detective and learning about a complete Holistic Medicine system that works. Frankly much of what I learned blew my mind. "The supposed best health care system in the world" had failed to make them better, and even more discouraging had made them worse off than before they got that care. Imagine that you, little old you, treated these kinds of patients with what you had just learned...and they got better!.. How would that make you feel?....Ask your self if you would care where that information came from? And now that you know it works...what would you do with that information? Would you not want to share it with more people who need help? Would you not want to teach others how to become a Holistic Medicine Detective so that they could improve their health and help others improve theirs? Click here to go to my "About Me" page if you would like to learn more about me and my credentials. The Holistic Medicine Detective Discovers Where All That Wonderful Life Enhancing, Healing, Disease Preventing Information Came From! ...Imagine then that a lot of this Holistic Medicine information is over 3,000 years old and some even 4,500 years old documented in writing originating that long ago in what is now known as China? It was lovingly preserved in writing, passed down from one generation to the next, treated as the priceless information that it was and still is. This sacred knowledge was packed in the Tombs of Kings and other leading figures. They even left bronze statues with the acupuncture points and channels etched into them. They lovingly detailed the medicinal effects of thousands of not only herbs, but foods and other substances as well. This is how those who lived back then considered it, even so many thousands of years ago. They cared not just about themselves but those they loved. Is that so surprising? People have always cared and were concerned about helping their friends and family live long and healthy lives. You may be excited by this...or not. Seriously, what is going through your mind? Right now? Did the skeptical, cynical voice just start providing its same old, same old...thousands of years old information?...nothing that old can possibly work, or even nothing will work for me. Did you just go into denial and discount mode? Did your BS detector just go into hyper-drive? Fine...but it's not really fine is it...not really. You or someone you love and care about are still sick or hurting. You may be asking yourself about now, "how could ancient health information be valuable to me today in today's modern, sophisticated and High Tech World?" You know, we of the West had our own similar Holistic Healing Traditions, but unfortunately the Romans destroyed all the European libraries of the Ancient world that predated their culture. They weren't very tolerant to say the least. So our knowledge was greatly diminished. This is all ancient history right? Are you really going to give up on your dream of better health and quality of life now because you can't get your mind around the fact that ancient knowledge of herbs, food, acupuncture and other healing techniques may just be more effective than some want you to believe? Do you have the courage and willingness to be a seeker of truth and understanding? Why not put aside cynicism for a while and keep an open mind as you think for yourself...evaluate for yourself. Do you care about your own health? Do you care about the heath of those you love and care about? May I have a little more of your, and I mean this sincerely, very valuable time to consider, to explore and to discover Holistic Medicine and Natural Medicine truths that have never changed over thousands of years? Do you know that you, the human being you are today, physically, mentally and emotionally is basically no different than those humans who lived a few thousand years ago? Also, did you know that this information has been continually validated and updated and revised as new discoveries have been made in the understanding of human health and of plants and foods and the tools of healing. Oriental Medicine with its Holistic Medicine and Natural Healing approach is one of the most widely used health care and improvement systems and has been continuously successfully used by more people throughout history than any other health care system. You Tell Me If This Isn't The Truth? How often has it produced problems, unintended consequences (side-effects) and even deaths? "Why do people take this stuff? It sounds like the side-effects are worse than the problem they are "promising" to solve?" If so you are one of the many for whom such dangerous practices are not very appealing. Every day I see in my practice how Holistic Medicine, Natural Medicine, Holistic Healing and Natural Medicine Techniques including those of Acupuncture and Oriental Medicine deliver successfully on their promise of improved health. Do You See Why The Information I Am Communicating To You Is Important? It Could Save Your Life...Or The Life of Someone You Care About! I know you do care about yourself and others who are suffering poor or ill health or you wouldn't still be reading this and that is why I challenge you to be a Holistic Medicine Detective and continue reading, and yes learn how to take good care of yourself and those you care about. I'm not going to tell you made up stories, I am not going to give you cold statistical analysis about what works and what doesn't. As you may have discovered statistics often lie, or mislead or can be used to prove anything. ...And I'm going to also tell you the bold, bald truth about what works and what doesn't work. This is a David and Goliath story! The Holistic Medicine Detective discovered that our modern day Goliath to be the corporate purveyors of Modern Pharmaceutical Drugs, and risky and often damaging surgical techniques. Goliath isn't the Doctors, Nurses or physical therapists who set your broken bones or replace your hip if you have fallen or those who help you recover. No those are wonderful successes in modern medicine. They often are wonderful caring people. The real, the true David in this story is Holistic Medicine and Natural Medicine healing that has worked for thousands of years very successfully....and it is also what has been discovered more recently that truly works and does no harm. Somehow in our modern world it became effective (more accurately put "profitable") for Madison Avenue Marketers to hype risky or damaging drugs and surgical interventions as being the brightest, shiniest and newest and therefore the best. Often they are promoting what are at best often "medical experiments" on us all. And following their empty rhetorical logic, they have in effect told us all that "modern Allopathic medicine" completely replaces what had worked very well for thousands of years (and still does I emphatically add) all in the name of increasing the bottom line...profits. Often leaving you at the mercy of predatory and unsafe and even at this time discredited medical practices. You might wonder...Dr. Eichenauer, Are You Against Progress? If that is what you're thinking, you're wrong. I love progress and I love technology. Remember, you are reading this on the internet. I built this Web site myself using my brain and the fantastic technology that has very recently been developed. Nope, no, I am not guilty of blind obedience to the traditions of the past. I'm just sick and tired of being lied to by people who don't give a damn about the negative impact of what they do to others. I'm angry at people who apparently only care about the money and refuse to be responsible with and to and for the people they supposedly serve. It hurts me to know they kill thousands every day and that's alright...John Dean of Watergate fame called these kinds of people psychopaths... people without conscience. Why Do You Care So Much About Holistic Medicine and Natural Medicine? Here is one example of why I care about Holistic Medicine and Natural Medicine and it's a very real example of how "modern medicine produces mayhem" and Holistic Medicine does not. My parents had my tonsils and adenoids removed when I was a child...something not done very much today because tonsils and adenoids are now known to be one of the first lines of defense of the immune system against colds and flu. My parents had this done to me because they loved me and wanted the best for me and they were told it was the right thing to do. They did it because they saw their 4 yr. old child suffer at times from very painful sore throats and they were concerned. And they did it because they put their blind trust in so-called experts. There were other opinions out there saying this is unnecessary, too risky, not being done for a proven risk. But they didn't have access to that information. And the Doctors my parents unfortunately found, like many today, used fear as the goad to prod my parents into doing this to me. Just as they use fear today to intimidate people into having risky or dangerous procedures or procedures having no proven benefit. What is now undisputed is that my tonsils and adenoids were doing the job they were supposed to do as a first line defense against colds and other infections. ...but the Surgeon said, let's make it a two-fer. Since we are going to be cutting on the boy, let's circumcise him as well. Interesting, I wonder what could have motivated him since I wasn't Jewish? Could it have been money? They said it was a personal hygiene issue. So, here I was, my parent's only child, and I occasionally suffered from recurrent bad sore throats. They didn't want me to suffer and so my parents, loving me, sought the best medical advice they "could find" to stop my suffering. They did what some of the doctors of that time, the 50s, told them to do. What did they tell my mom? In effect, "why are you letting your kid suffer that way? When we can so easily remove the problem." What they, the "expert doctors" and my parents, who couldn't be faulted for their ignorance, failed to grasp is that my mother breast feeding me would have given me her immunity to many of the same bugs that made me sick so many times...over the years. After all, this is the way human infant were designed to be fed and one of the things that naturally happens. Why tell mothers not to breast feed unless you could make a fortune selling artificially manufactured chemical milk to the people you had just mislead into believing that only primitive savages and monkeys and other primate animals breast fed. They compromised my immune system big time. The doctors completely grasped the idea of scaring a young mother into doing what would profit them by suggesting the loss of sexual attractiveness that would come from sagging breasts. Let's see...human mothers, all mammal animal mothers, breast feed and have since the beginning of time, but the mighty "modern" doctor knows better...than what has worked for the history of humanity on this planet. And why did these wizard doctors do this? Because they would make a hell of a lot more money doing it this new way and very harmful way. Why else go against nature and history? You know I can't recall a single valid reason against breast feeding other than if the mother does not have enough milk to feed the child or if it would compromise the health of the mother. Is there any women on the planet in the history of life on this planet whose breasts didn't sag when she got older? Name one. I challenge you. You do get the point. Breast feeding...yes...no need to remove tonsils and adenoids...no reason at all. Circumcision...any justification other than religious tradition? I think not. You have to learn to think for your self, and to do that you need to know the facts and the truth. You need to become your own Holistic Medicine Detective! Have You Figured Out Yet What I Do Believe In? As do all good Holistic Medicine Detectives, I believe in what works...what has been proven to work..I don't believe in what is proven to not work. I like it when something I buy works...I like it when I take a remedy for what ails me and know that it is safe and effective. I like it even better when that remedy has worked successfully for thousands of years. Kind of reassuring, you know. I like it when someone says I can help you with that health problem and then they actually deliver on their promise and don't create half dozen other problems with their solution. Again, Holistic Medicine does not create problems, it solves them. I love it when an honest mechanic tells me, see it's just this little widget here that needs to be replaced or lets just clean this connection out....they do it and wow, my car is as good as new and they only charge me $50 when the place down the street told me my car needed major surgery...a new engine for $5,000. I appreciate honesty...I appreciate things that work....and I appreciate things that save me money.....I bet you do too! I am not here talking with you as a lover of all things past... a technophobe. There are a whole lot of things from the past that are better left buried in the past. Hummm, what about blood letting until you die? All because he had noticed that when doctors washed their hands before performing surgery or delivering babies, people didn't get infections. He was called crazy by his fellow physicians and surgeons. This is relatively recent history. I want to go on record here and now as being absolutely opposed to anything that was or is now done out of ignorance that causes anyone harm. All of the above is why it is important for you to become your own Holistic Medicine Detective and know something about how your body works and what can go wrong with it. Doesn't that make sense? Do You Like A Good Mystery? Are You Willng To Think For Yourself and Therefore to Be Your Own Holistic Medicine Detective? If You Are Ready, Let's Get About It Then! Care To Follow The Path of Knowledge? Care to learn More? Click here...to learn what you need to know to help and protect yourself and those you love and care about. Click here to get a copy of my FREE Monthly Holistic Oriental Medicine Newsletter! Click here to order your copy of my New Holistic Medicine E-Book! Return From Holistic Medicine Detective to Holistic-Medicine-Works!